When you have an abundance of summer berry fruits on your hands, one of the best ways of serving them is in an English Summer Pudding. The recipe is so easy, and the results are so delicious, you won't be able to resist. It contains all the tastes of summer in one dish! Which berries you use is up to you. 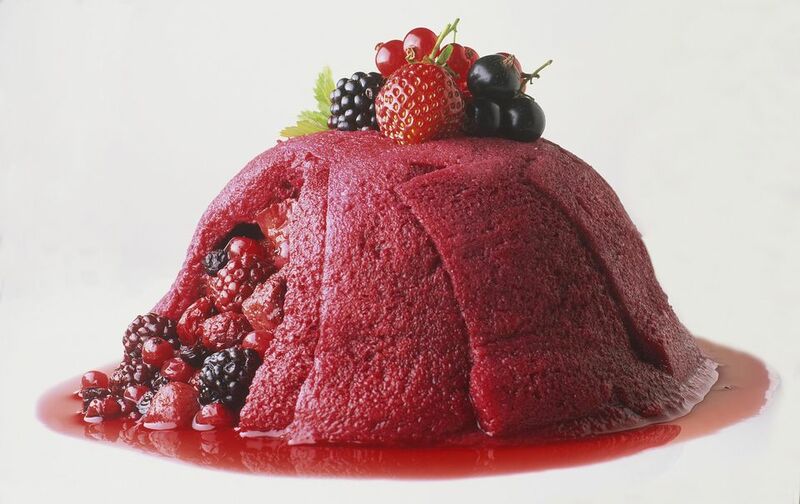 Soft summer fruits suitable for Summer Pudding must have a rich, strong, colour and flavor. Great berries to use include raspberries, strawberries, red and blackcurrants, damsons, and blackberries. The berry juice is also very important so make sure your berries are ripe. You can also use a mix of frozen berries too, just make sure they are thoroughly defrosted before you use them. Use a good loaf of bread for the pudding. Cheap, sliced bread gives totally the wrong texture. Stir the water and sugar together and bring to a gentle boil. Add all the berries and fruits except the strawberries. Stew the fruits very gently and not for too long. They should simply be softened but still retain their shape. Once you feel they are ready put to one side (juice and all) and leave to cool. Cut the slices of bread into half the each half into triangles. They do not all have to match perfectly; you will use these to line a 1 1/2pint/700 ml pudding. Start by lining your pudding basin with cling film. Then continue by dipping a couple of triangles in the juices of the stewed fruits. Lay these in the bottom of the dish and then continue the same way but lining the sides of the basin with bread slices ensuring there are no gaps. Once completed, fill with the stewed fruits including the strawberries. Cover the top with more juice dipped bread slices. Make sure not to add too much of the juices from the fruits as this may cause the bread to lose its shape. There must be enough to soak into the bread, though. Place a saucer on the top of the basin and weigh down with something heavy like a tin of tomatoes or beans is ideal. Place in the refrigerator and leave overnight. The next day, turn the pudding out onto a pretty serving plate and serve with either the whipped cream or make some lovely custard sauce. If you are lucky enough to have scorching sunny weather, then serve with ice cream.